Even with Instagram emulating Snapchat with their stories, we never expected them to copy exactly. Instagram works in a different way to Snapchat and the way users find each other is different. You can't expect them to both work in the same way and from now you are going to have to think of them as different packages. On Snapchat you have to know someone's username to add them on but on Instagram you'll soon have users recommended to you. Recommendations are either something you love or hate on social media. If you don't mind your account being public, it can be fun to check out other users and see what they post. Some of them you might decide to follow but others you won't. However, these recommendations can get a little annoying. If you want to add someone on Facebook you don't need them recommended to them but on Instagram, it's actually difficult to say. Stories is not Snapchat. Yes, you can send semi-private pictures to your friends but it was also built to be a product that can stand up on its own. You can just spam everyone with a lot of pictures that aren't good enough to stay on your profile or you can let your followers have a sneaky peak what you're doing if you're in a hurry and won't post anything complete until later. Snapchat, on the other hand, feels more like a messenger, just one that focuses on images and video rather than text and conversation, though you can do that too. This means that just because recommendations would weird people out on Snapchat it doesn't mean that they won't work on Instagram. The explore tab on Instagram is used by a lot of users for extended periods of time each day. 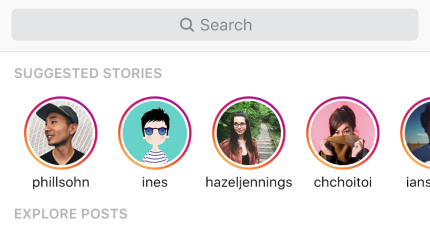 People on Instagram want to find new images to like and people to follow, recommending people to follow on Stories is likely going to work in that section. There is still the aspect of privacy that means some users might not want to use Stories like they do the rest of Instagram but until this feature rolls out to everyone, we won't know for certain. Stories is doing pretty well on its own and though some users are slowly growing bored with it, this new update could draw people back in. As for how else, they'll improve on the feature? We can't really say as Instagram are keeping their lips tightly sealed.